Frosted vinyl to enhance branding. Mark Your Space gives you a cool, clean design. A very complex logo with many colors is difficult to reproduce, and may even be distracting. You want to stand out, but you don’t want to overstate yourself either. This balance might take time to reach, but it’s worth the effort in the end. Acrylic lobby signs are great not only because they look good, but they also last long. Quality materials resist fading and warping. Cleaning and maintenance are easy as well with acrylic office signs. The signage at Applied Systems reveals how attractive and easy this kind of signage can be to install and maintain. Another advantage is that if any of the lettering gets damaged, it’s easy to replace without having to replace the entire sign. Subtle details can help establish your brand in the mind of any potential client or customer. 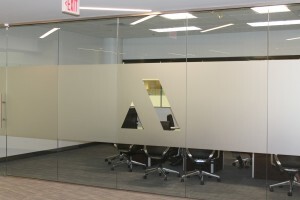 Frosted glass signs, for example, help spruce up the office while continuing to support the branding process. All of this transmits professionalism which helps build trust. Transmit your brand effectively with Mark Your Space. Don’t forget about your staff. When they come to work, they want a warm, professional environment as well. Employee loyalty is just as important as customer loyalty. And good office signage can help establish loyalty across multiple different business relationships. Even the greatest logo or lobby sign can’t work by itself. It takes time and effort to build a dedicated following. But as your business moves forward, the value of a well designed image will increase. It pays to look good from the start. Want your lobby sign to look perfect? Then contact us or give us a call at (630) 289-7082. Serving Chicago and the surrounding area. Title: Acrylic Lobby Signs | Mark Your Space | Chicago Area Sign Co.